Poor Mojo's Classic Squid: Squid "Ask The Giant Squid: The Giant Squid presents MonkeyZen, grouping the first, item two of three "
Loyal Reader-Types, welcome to this second iteration of my newmost feature, "The Giant Squid Presents," in which I nobly endeavor to raise you and your ilk up from the base savagery of bipedal existence, towards a brighter, more brachiated future. Please to enjoy, at this instant, this newest piece of the MonkeyZen, in which we observe MonkeyZen's noble adventures along the Searing Surface of your world. Panel the First: In distant silhouette we view our hero, MonkeyZen, and what might well be a very basic duck. It could also be a cast iron pan set atop a stump in an open field. Panel the Second: A set of juxtaposed extreme close-to-ups reveal that MonkeyZen (focused in the upper-anti-dexter corner of the frame) is actually standing opposed to a small be-ballcapped boy (pictured in the lower-dexter corner.) They stare at one the other, pensive. Panel the Third: The becapped not-duck speaks to MonkeyZen as follows: "Daddy bites." And do we not sense a chagrin upon the visage of MonkeyZen? First, to note: It has recently come to my attention that, due to an over-quick reading of my weekly e-mail allotment, I initially misinterpreted some key facts, viz. the strange and elusive composer of the fine MonkeyZen comedy strip. It appears, upon further examination, that NickSnow is not a coarse, knuckle-dragging textile-ape— like the vast majority of my readers— but rather an impish and rather charming capuchin monkey. As such, this further data shall well inform my weekly interpretation of the MonkeyZen. Additionally, the capuchin NickSnow resides in the Ypsilanti, not in the Ann Arbor. One thousand apologies for these errors. 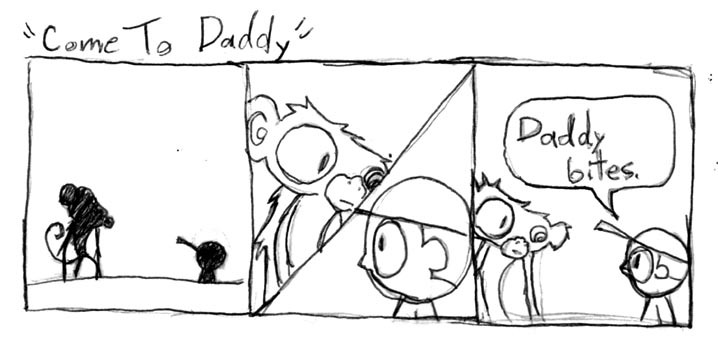 Brief Interpretation: This comic is graceful and fine in its simplicity, and the conclusions are singular and clear to see: MonkeyZen is the father of this not-duck boy, a father not nurturing, not loving, not supporting, but a father vicious. Nonetheless, he is at least a father present in his boy's life (for, can it not be certain? A father absent cannot be a father biting) and that much can be applauded. We, as readers, are left only to hypothesize on the identity of the mother and the exact nature (not to mention legality) of the nuptials themselves. I likely speak for all when I declare that this, indeed, is a disturbing universe.